Chef Bell Andrews makes a meal from scratch with love. What a difference a couple of years make. When I last visited Leon’s, it had just opened. The name was Leon’s Kitchenworx and it was a bit of a work in progress. The interior was dominated by a deli case displaying some tasty looking prepared foods. Brand new to Barrington and tucked out of the way, it hadn’t yet had time to win people over. So, it was with some pleasure that I sat outside this same spot two years later, having to wait patiently to get in for Sunday brunch. With nice renovations on the inside and out, the cafe was positively buzzing and had a more focused purpose and identity. The signage was the first indication that changes were afoot, sporting far more modern typography and design on an exterior of newly painted brick. Inside, the deli case was gone and in its place was a modern black bar. The interior was a place to eat now, a cafe first and foremost. Behind, hinting at a dinner service that’s on the way, was a nascent wine collection. The whole interior was sensible and clean: a massive improvement. What hadn’t changed was chef/owner Bill Andrews himself. While the whole dining room had been expanded and refined, jutting out into the room was his domain: the relatively small front kitchen. He’s not putting on a show exactly, but he also can’t help himself from being host as well as chef, greeting nice people as they come in, defending his waitstaff from not-so-nice people and perhaps having a little dance while cooking. This wasn’t an open kitchen in the modern sense, it’s more galley than gallery. Bill has worked in some large and far more elaborate places in the past, but he must feel very much at home with a more stripped down approach because his small setup has remained a constant through the renewal and rebranding. What he is hoping sets the place apart isn’t what happens when the French toast hits the hot pan, but instead the prep work before the doors are even opened in the morning. If the front of the kitchen was small, the back boasted a baker’s dream of a wood island, ovens and plenty of room. This meant a lot of customers enjoying his calzones, quiches and other baked goods. His setup matches how he approaches his food, even when it comes to the basics of brunch. French toast is pretty straightforward, but he uses the bread he bakes fresh daily. Sausage patties aren’t stretching the boundaries of breakfast meat, but he grinds and mixes his own. Nothing is simpler than bacon, but he cuts it, rather than buying pre-sliced, and he does so nice and thick. I went for the one-of-everything Mixed Grille Platter ($12), while my wife took on the specials board with a Coconut Waffle with pineapple mango compote ($10). Then, OJ ($2.75) and a Bottomless Coffee ($2.50). The latter was everything you could want in a diner coffee. I’m a reformed coffee snob and as such once in a while walk amongst the common soldiery like Henry V in the realm of blends and milk-swilling infinite-refills. The coffee was fresh and clean, which is all too often not the case. My Mixed Grille was a dish straight out of a greasy spoon, but without any grease. The home fries and corned beef hash were very good; I could have gone for a full plate of the latter. The sausage patty wasn’t the sketchy mystery meat variety, rather it was well herbed and seasoned. I’m particular about my eggs and the bacon was a bit too crispy for me, but it was good quality and cut thick. My wife’s Coconut Waffle was topped with a compote of small chunks of pineapple, mango and coconut flakes. No syrupy mess; no soggy waffle. It was crisp on the out and good and fluffy on the in. 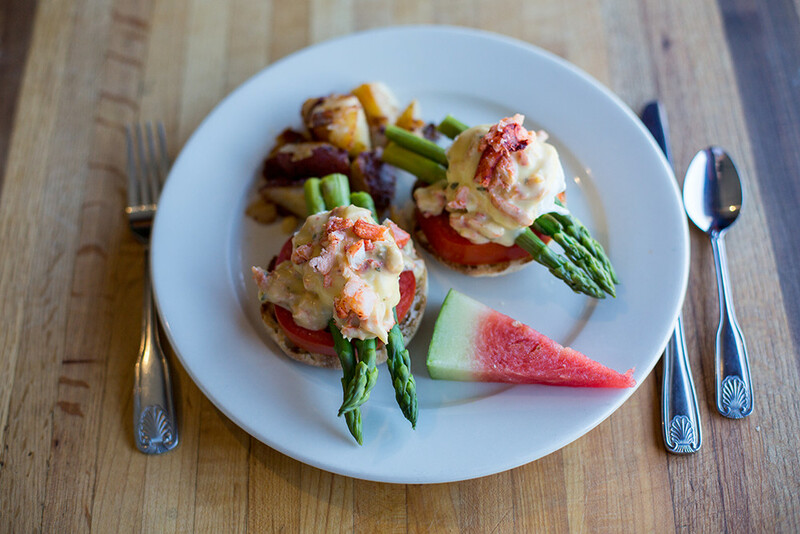 There are some more “fancy” items on the menu, for instance a Tomato Asparagus Benedict with lobster that turned my head as it floated by. Fancy isn’t really what this brunch was about though. It was more about making some of the classics with no corners cut, at a really fair price. For both breakfast and lunch, the majority of the menu is sliding in just shy of $10 a plate, whether it’s scrambles, pancakes, salads, sandwiches or Eggplant Parmesan. “You don’t need a silver fork to eat good food,” says the sign in Leon’s bathroom. It’s likewise true in the dining room. Leon’s is a place that has found its stride by reinventing its appearance, but not its approach to food.